Playworks is the leading national nonprofit leveraging the power of play to transform children’s physical and emotional health. Playworks currently serves more than 900 schools in U.S. 23 cities, and reaches almost half of a million students directly and through professional training services. We believe in the power of play to bring out the best in every kid. 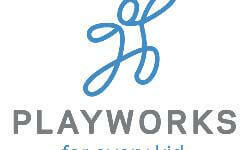 Playworks creates a place for every kid on the playground. It doesn't matter if children have never learned or played games before. We ensure they have a place that is safe and welcoming – where they can play, thrive and contribute. Our goal is that every child takes this positive experience back to the classroom and back to their communities. Through our full-time, year-round direct service model, our coaches enhance and transform recess and play into a positive experience that helps kids and teachers get the most out of every learning opportunity. Our rock-star coaches strive to know every child by name, orchestrating play and physical activity through the five components of the Playworks program every day.Playworks’ direct service model has been proven to decrease bullying behavior, increase physical activity and support learning. With hands-on professional development workshops and collaborative consultation, Playworks Training provides school staff with the step-by-step guidance and tools needed to create a positive recess environment for their students. Beyond the playground, Playworks supports out–of–school time staff with techniques to create more inclusive and healthy play opportunities for the youth in their programs. Through this professional development, our partners develop the essential skills to transform playgrounds and youth programs and change lives. Randomized controlled trial of popular recess program shows widespread benefits, including less bullying, more physical activity and more time for teaching. -Less Bullying. Teachers in Playworks schools reported significantly less bullying and exclusionary behavior during recess compared to teachers in control schools—a 43 percent difference in average rating scores. -Increased Feelings of Safety at School. Playworks teachers’ average rating of students’ feelings of safety at school was 20 percent higher than the average rating reported by teachers in control schools. -More Vigorous Physical Activity. Accelerometer data showed that children in Playworks schools spent significantly more time in vigorous physical activity at recess than their peers in control schools (14 percent versus 10 percent of recess time—a 43 percent difference). -Ready to Learn. Teachers in Playworks schools reported spending significantly less time to transition from recess to learning activities (34 percent fewer minutes).